Due to the rapid development of the Internet, the Internet of Things and communication technology, the number of telecom base site and it's stationary battery has increased rapidly. But in order to ensure the 4G/5G signal uninterrupted , each base station has a fixed backup battery to ensure the continuity of telecommunications services. A loss of backup power during an outage without Smart Battery Saver and Monitoring System can cause not only lost business, but also costly repairs. However, replacing backup batteries based on a periodic schedule is inefficient and lots of the batteries may still have a lot of life left in them. This is huge waste of money and battery resources. 2V Telecom Base Site Battery Protector System is the Battery Smart Pulse Maintainer technique for 6V battery pack in series by 3PCS 2V cells. It is working as a new generation of high-tech products for daily battery maintenance and battery equalization in sites or other stationary power system. The long-term work in parallel at the battery, the sulfated crystals can be effectively removed, and prevent the new sulphation buildup. The battery capacity is significantly maintained as new one for long time. MCU ( Micro-controller Unit) design, Constantly scanning the battery terminal voltage and reasonable output digital intelligent resonance pulse. It is used for 6V/200AH-6V1000AH battery bank series by 3 PCS 2V/200AH-2V/1000AH Lead Acid Cells. It is only used for the Maintenance and Life extension of new batteries in Telecom Base site, or used after repaired by our off-line Battery Repair System. Prohibit the use of aged batteries in the absence of being repaired. Once the violation, it may not reach your expectations. ②	Negative pole of input / output line. ③	Positive pole of input / output line. ④	Trigger signal output line. ⑤	Trigger signal input line. ⑥	Trigger signal output jack. ⑦	Trigger signal input jack. 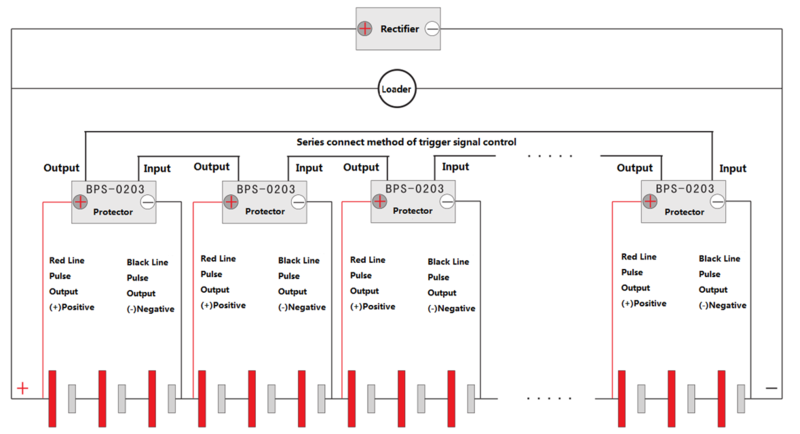 ⑧	Trigger signal: the signal flashes once, indicating that the maintenance system stops working, enters the waiting state and sends out a signal to trigger the next maintenance system equipment to enter the working state. ⑨	Status indicator: display maintenance system working status. The indicator light is green to work in pulse maintenance state; red denotes working undervoltage state; flashing red denotes working in overvoltage equilibrium state; extinction indicates waiting state. 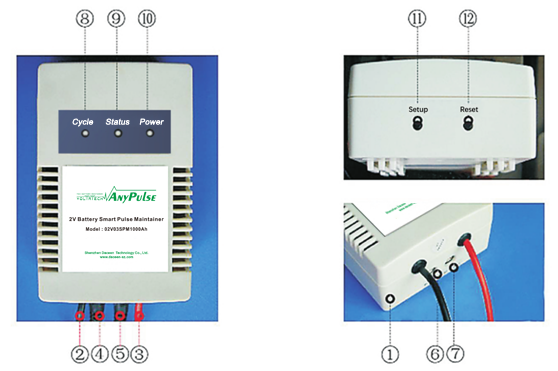 Looking for ideal Smart Pulse Maintainer Manufacturer & supplier ? We have a wide selection at great prices to help you get creative. All the Battery Charging Optimizer and Equalizer are quality guaranteed. We are China Origin Factory of Smart Battery Saver and Monitoring System. If you have any question, please feel free to contact us.